BREVARD COUNTY, FLORIDA – With apologies to Virginia, Florida is the state that’s really for lovers. With clear blue waters, a daily stunning sunset, and hundreds of top locales offering entertainment suited for two – it’s easy to see why couples flock to the Sunshine State for some R&R. If you and your boo are planning your next getaway, you should consider these four Florida hot spots. Below you’ll find a bit about each city as well as top activities for couples. Stay and play and fall in love all over again. Romance abounds in Melbourne, a beachy community along Florida’s Space Coast within Brevard County. Take a stroll along Historic Downtown Melbourne and elsewhere around town where there’s plenty of shopping and candlelit dinner opportunities. You can bask in the sunshine on miles and miles of Melbourne’s unspoiled beaches by daylight or, at night, enjoy a romantic moonlit walk, complete with tropical breezes. Melbourne also is the home of annual festivals such as the Independent Filmmaker’s Festival, Arts Festival, Aviation Day and Oktoberfest. Wickham Park – Beautiful outdoor park perfect for lovers and campers. Swim, bike, hike, and enjoy the views. Crush Eleven – Hand-crafted cocktails and swanky ambience make Crush Eleven a lovely date night choice. FIT Botanical Garden – A stream bordered by a shady hammock abounding in palm trees and other tropical growth winds through the heart of the Florida Institute of Technology campus and is the setting for a 15-acre Botanical Garden. Brevard Zoo – Are you or your partner an animal lover? See exotic flora and fauna as you stroll around the grounds at Brevard Zoo. Sebastian Inlet State Park – Surfers from around the globe flock to Sebastian Inlet State Park to ride “First Peak” and “Monster Hole,” but this pristine park is more than just a Florida surfer’s paradise. Visitors stroll untouched beaches, collecting shells and observing sea turtle nests, or try their luck fishing from one of the jetties that slice into the Atlantic. Calmer waters on the Indian River Lagoon beckon kayakers to explore wild beauty. Most of the cities on the “Treasure Coast” of Florida have been over-developed over the years. High rises, tourist traps, tacky souvenir shops, and bustling boardwalks rule the day. It’s hard to have space and privacy. It’s hard to appreciate nature and truly relax. Unless you’re staying in Vero Beach! 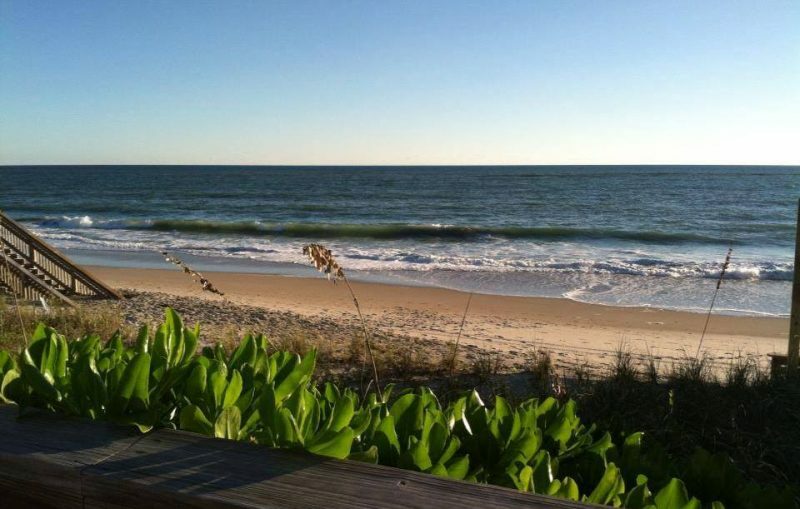 Vero Beach has been named one of America’s “Best Arts Towns” and is the perfect location for golf, watersports, and many other activities throughout the year. Here, no building can rise above four stories. Here, the feeling is more like a lazy seaside village than a buzzing hot spot (in a good way.) Here you won’t be sitting in traffic, and you definitely won’t be waiting for a table. Treasure Coast Seaplanes – Treasure Coast Seaplanes offers the Treasure Coast’s most unique eco-tour. The amphibious seaplane allows you to see the Treasure Coast as it is meant to be seen…by land, sea, and air! Hold hands and look out on the amazing views. Riverside Theatre – Surprise your sweetheart with tickets to a show at Riverside Theater. A rotating schedule of stand-up comedians, musicals, and more make it easy to choose a show that you’ll both love. McKee Botanical Garden – Tranquility is everywhere at McKee Botanical Garden where the fresh air and gorgeous flowers are just begging to be explored. Tides of Vero – With Southern, Latin, Caribbean and classical French influences, diners are treated to the freshest seafood, locally grown and organically raised vegetables and fruits, and only the finest quality meats to create masterful presentations of both flavor and form. To add to the dining experience, The Tides offers a wine list which has received the Award of Excellence from The Wine Spectator for 17 consecutive years. Ever been to Florida’s “Space Coast”? You and your partner will have plenty to do under the sun and in the sea in Cocoa Beach, including possible viewing of a real rocket launch! 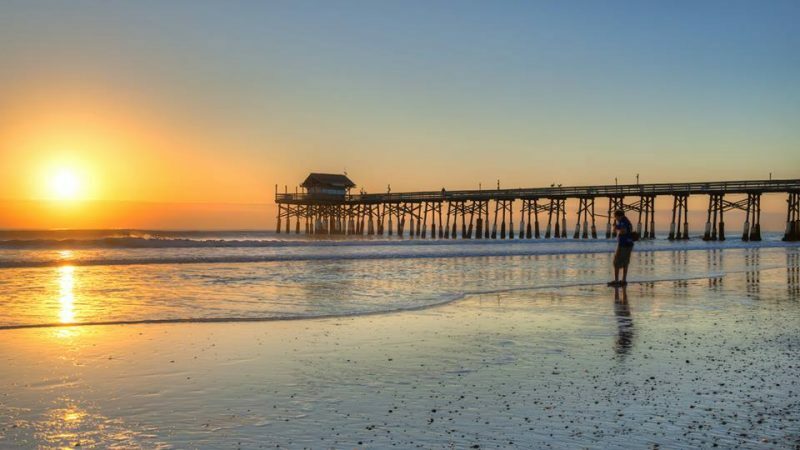 Check out the world-famous pier, sift through the merchandise at Ron Jon’s Surf Shop, explore Kennedy Space Center, and hike through local nature preserves. And remember this: Cocoa Beach is only an hour’s drive east of Orlando, making it a great day trip for theme park visitors. Amelia Island Horseback Riding – Book a sunset beach horseback ride with Amelia Island Horseback Riding for a seriously romantic excursion. Amelia Island Trolleys – Whether you’re in the mood for a spooky night, looking to explore the local history, or you’re in town for the holiday light show, there’s no better way to see Amelia Island than on an antique trolley! Amelia River Cruises – Take a twilight river cruise with your spouse or even better, book out the whole boat for a once-in-a-lifetime private trip. Amelia Island Kayak Excursions – For the outdoorsy couple, Amelia Island Kayak offers 2-hour local guided tours as well as 5-hour river tours and even overnight excursions for the more adventurous folks. The best part is that virtually anyone can kayak! With the help of our skilled tour guides, you can explore exclusive destinations that simply can’t be seen anywhere else. David’s Restaurant and Lounge – If you like a perfectly cooked steak and a whiskey to match, book a dinner date at David’s Restaurant and Lounge on your visit to Amelia Island. 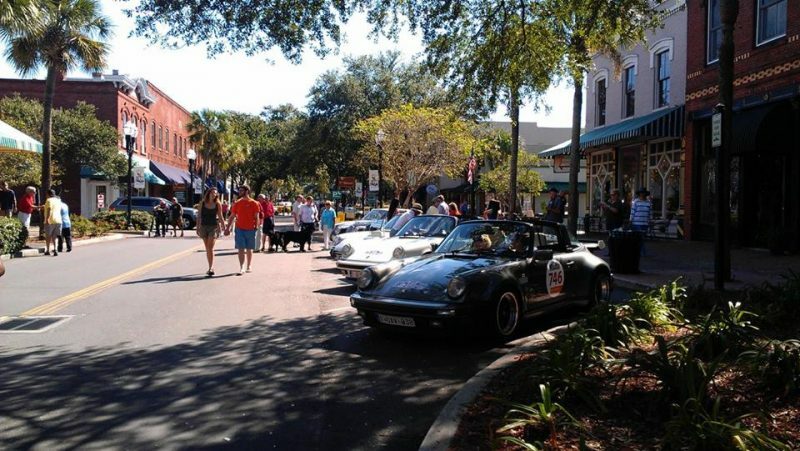 Amelia Island offers 13 miles of unspoiled beaches, calm waters, and plentiful wildlife. 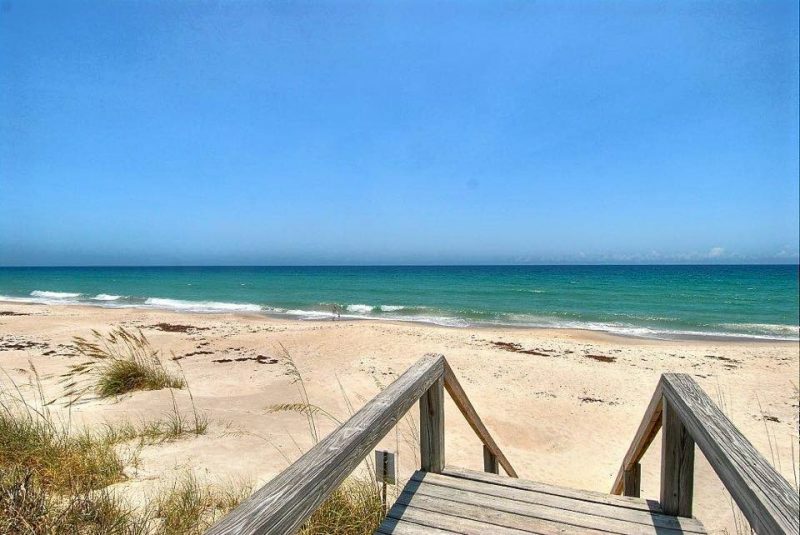 Just off the northeast Florida coast, thousands of couples flock to this barrier island for honeymoons and babymoons each year. Play golf or take a romantic stroll along the beach with your partner. The white quartz sand feels so good against your feet as you walk hand-in-hand. Salt is a must-visit restaurant for those who want an upscale meal — it’s one out of only three AAA 5-diamond restaurants in Florida. If you’re more of a sea-faring type, admire the area’s incredible natural beauty from the comfort of a slow-moving kayak. The Florida Key Lime Pie Company – By far Florida’s best key lime pie! Treat your sweetie to a sweet treat on a hot day at The Florida Key Lime Pie Company. Lighthouse Cove Adventure Golf – Lighthouse Cove hosts two fun-for-all courses, each with 18 holes. Paradise Falls serves up excitement for couples of all mini golf ability. This winding course has several water features and hills, promising a variety of fun at every hole. For those looking for even more adventure, there’s Lost Lagoon, which covers undulating terrain, caves and more. Don’t forget to order your favorite beverage while golfing. They deliver drinks (including beer and wine) to your exact location on the links! Ron Jon Surf School – For the active couple who always dreamed of learning to surf, Ron Jon Surf School is a wonderful way to get out on the water and try something new. Book your lesson in advance! Lori Wilson Park – Lori Wilson Park is a regional beach side park featuring beach dunes and maritime hammocks. The park features pavilions for public use, a boardwalk, year-round lifeguards, onsite vendors, dog park, restrooms, outdoor showers, drinking fountains, and much more. An ideal place for a sunset stroll in Cocoa Beach. Rikki Tiki Tavern – Located at the end of the 800-foot long Pier, directly over the ocean, is the new, improved Rikki Tiki Tavern featuring spectacular ocean views, open-aired seating and all of your favorite specialty drink concoctions. The new Rikki Tiki Tavern spans the end of the Pier and includes table and bar seating for 100 guests, a thatched roof covering the entire deck and, for the first time, food service. A really unique drinking and dining experience in Cocoa Beach! 321 Kiteboarding – Whether you want to fly a kite for the first time, having trouble staying upwind, or are an experienced kiteboarder looking for new moves, book a lesson with 321 Kiteboarding. You’ll love the adrenaline thrill of kiteboarding under the hot Florida sun. Cocoa Village Playhouse – Located in beautiful downtown Cocoa Village, the Historic Cocoa Village Playhouse provides affordable community theatre and promotes lifelong education in the performing arts for Brevard County residents and visitors. See an incredible live show and surprise your partner with ‘dinner and a show’!